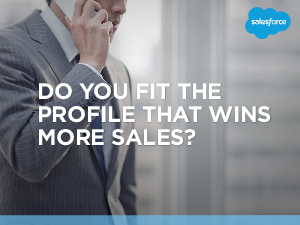 > Salesforce > Do You Fit the Profile that Wins More Sales? Do You Fit the Profile that Wins More Sales? Find out which type of sales rep is mostly likely to succeed in the current economy. Corporate Executive Board asked over 450 front-line sales managers and their direct reports questions across 44 different attributes, covering areas such as attitudes, skills, behaviors, activities, and knowledge. Get the eBook to find out which sales profile wins the most deals and how all your sales reps can be more successful.